Our Italian artisan, Letizia, masterfully handcrafts this charming Santa figurine, inspired by traditional Italian puppetry. Each piece is turned out in meticulously sewn fabric that she collects from local Italian markets. His sculpted face is hand-painted with rosy cheeks and snowy beard as he rides a wooden sleigh with a burlap bag filled of toys. 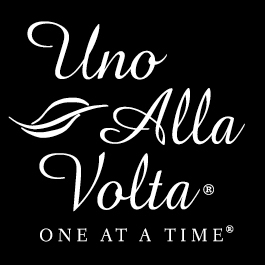 Each Santa Figurine is made exclusively for Uno Alla Volta, from the heart and hands of the artisan. No two are exactly alike. For decoration only, not intended as a toy. Figure measures 6in. x 6in. tall, with loop for hanging. Limited edition of 95. Letizia of Florence handcrafts our folk-art collectibles, uno alla volta, of hand-stitched fabrics, which she collects from local Italian markets. Her longstanding relationship with textile vendors gives her "VIP" access to some spectacular weaves.